Does Your Condo or HOA Need to Install a Pool Lift? We have been receiving calls and emails asking whether California condo, planned development, or stock cooperative HOAs are required to comply with a 2010 change in Federal law that requires that pool lifts be installed at public pools. We are hearing about this now because there is a deadline for their installation. 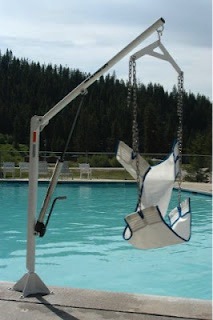 Have not heard about this pool lift requirement? The 2010 changes to the ADA (Americans with Disabilities Act) for public pool facilities require public pools to be more accessible for disabled persons. Small pools must have at least one accessible means of entry, either a lift or sloped entry. Larger pools must have two accessible means of entry such as a lift, sloped entry with handrails, transfer wall with grab bar, transfer system with steps, or accessible pool stairs. Slope entries and lifts are by far the most common. According to an article by Florida Community Association lawyer Lisa Magill (follow this link), “the major complaint against compliance seems to be cost.” The article said that permanently affixed pool lifts could cost about $10,000. Do Condos & HOAs have to comply?